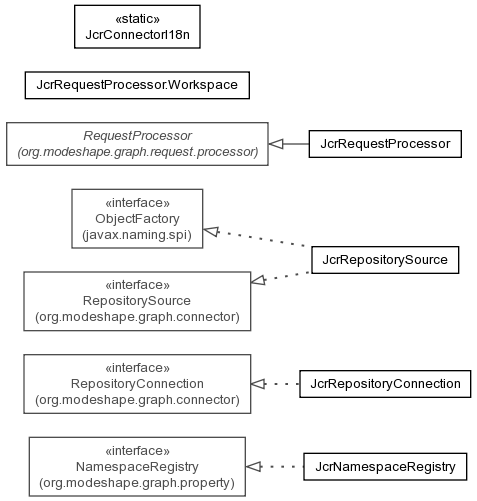 The JCR connector provides access to a JCR repository instance running in the same process (and accessible via JNDI). JcrConnectorI18n The internationalized string constants for the org.modeshape.connector.filesystem* packages. JcrNamespaceRegistry This represents the NamespaceRegistry implementation mirroring a supplied JCR Session. JcrRepositorySource The RepositorySource for the connector that exposes an area of the local file system as content in a repository. JcrRequestProcessor A RequestProcessor that processes Requests by operating against the JCR Repository.